Kudos to this Developer! I HIGHLY recommend David to anyone with a Joomla project. 3cellhosting is a small business which prides itself on delivering great service at affordable prices. Our hosting servers are based in the UK and we provide 99.99% server uptime. 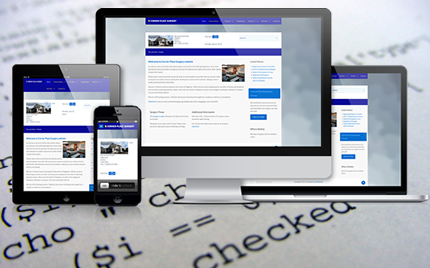 We also create, develop and design websites, ranging from bespoke sites and redesigns to Content Management Systems, E-Commerce and static HTML sites. Please browse our website for more details. Pricing starts from as low as £38.00 per year! All accounts are set up as soon as payment is confirmed so you could have your site live in a very short time. Whether you have a current site that needs redesigning or you want a new site then we are able to help. Check our FREE Guide to Planning a Website download. Need a domain name? Consider your key search terms as a domain name as that, alomg with good content, can influence search engine rankings. 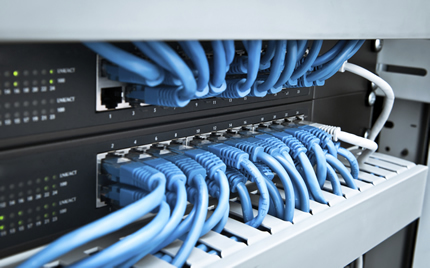 At 3cellhosting we do our very best to ensure that we provide a quality service at value for money prices. We will always give you the best advice we can, even when it may not be what you want to hear. From our experience with our loyal clients we know that it is important that we are flexible in our offers and packages so if you cannot see anything to suit your needs then please call us. We work hard to build a rapport with our clients as this creates trust and confidence, and we all know that people buy from people they like and trust. Years of experience means we can create the best solutions for your web presence, whether that is a new website or the redesign of an existing site. Not only do we come up with solutions for clients, we actually make sure they are implemented on tima and budget to agreed standards and expectations. We provide the ability for you to upgrade or downgrade at any time and with no hidden charges! Just check out our annual prices below(we do have other payment options such as monthly etc.). Most importantly we do not have a minimum fixed contract period. You are free to cancel at any time and any pre-paid unused complete months will be refunded. Includes cPanel, MySQL, PHP 5.4 to 7.0, and 10 email accounts. Includes cPanel, MySQL, PHP 5.4 to 7.0, and 25 email accounts. Includes cPanel, MySQL, PHP 5.4 to 7.0, and 50 email accounts. Includes cPanel, MySQL, PHP 5.4 to 7.0, and 75 email accounts. Includes cPanel, MySQL, PHP 5.4 to 7.0, and 100 email accounts. Website the website that you are currently using, https://3cellhosting.com, and any sub-domains of this site unless expressly excluded by their own terms and conditions. 4. For purposes of the applicable Data Protection Laws, David Goode trading as 3cellhosting is the "data controller". This means that David Goode trading as 3cellhosting determines the purposes for which, and the manner in which, your Data is processed. 27. Before the Website places Cookies on your computer, you will be presented with a message bar requesting your consent to set those Cookies. By giving your consent to the placing of Cookies, you are enabling David Goode trading as 3cellhosting to provide a better experience and service to you. You may, if you wish, deny consent to the placing of Cookies; however certain features of the Website may not function fully or as intended. Session Cookies To remember you and maintain your session whilst you are using our website. Account Management We use this cookie to identify your account on our systems. Can't find something on our website? Need some further information or clarification? Just complete the form below and we will get back to you. 3cellhosting ("we", "us") provides hosting and email, domain registration and dedicated server hosting services together with such other services as are agreed between it and the customer ("the Services"). 1. Conditions By subscribing to any of the Services and opening an account with us ("the Account") you ("the Customer") agree to be bound by these terms and conditions. These terms and conditions apply to all 3cellhosting accounts. They set out the basis on which we offer our services and should be read carefully. 2.1 3cellhosting will use reasonable efforts to supply a continuous service. However, 3cellhosting is not liable for any loss of data resulting from delays outside of our control, missed or non-deliveries, service interruptions or by errors or omissions of the customer. 3cellhosting is not responsible for any losses suffered resulting from acts of god or force majeure including civil unrest, riots, floods, drought, fire, war and imposing legislation. 2.2 You agree that 3cellhosting is not liable to you for any special consequential damages which you may suffer as a result of loss of business, contracts, profits, savings or otherwise. 3cellhosting is unable to exercise control over material sent over the internet and excludes all liability of any kind for the publication by the Customer of inaccurate, misleading, offensive, threatening or obscene material, or material that is in breach of UK or other applicable law. 2.3 3cellhosting's customers are liable for all charges levied by their telephone service provider arising from the Customer's use of the Services. 2.4 From time to time 3cellhosting or its sub-contractors need to carry out maintenance on the network, which may involve temporarily shutting parts of it down. 3cellhosting will give as much notice as possible and shall try to keep this work to the period specified in the notice. 3cellhosting accepts no liability whatsoever arising from such a suspension of the service. Proxy - We do not allow any proxy set-ups or connections or any sort of activity through remote proxy connections on our Shared Hosting, Reseller Hosting, VPS Hosting, Semi-Dedicated Hosting and Dedicated Servers. The first offense committed by the Customer will result in suspension of their Account. Any second violation will result in immediate Account termination. Bit Torrents: Use of software and scripts for "bit torrents" or similar is not allowed on our servers. This includes sending or receiving files using these mechanisms. 3.2 We are under no obligation to edit, review or modify the contents of your website unless we have a design and/or maintenance contract in place with you. However, we reserve the right to remove any content without notice. For the avoidance of doubt we do not pro-actively monitor messages that you may post on our managed sites, but we reserve the right to remove such message at our sole discretion. 3.5 The Customer shall defend and pay all costs, damages, awards, fees (including legal expenses) and judgments awarded against 3cellhosting arising from breach or breaches of this Clause 3. 3cellhosting may in its absolute discretion defend such claims and may compromise such claims with the consent of the Customer, such consent not to be unreasonably withheld. The Customer shall provide 3cellhosting with the assistance necessary to defend such claims, at the Customer's sole expense. 4.1 You agree and understand that we are not the domain registrar therefore we do not have our own nominet tags or NIC tags. 4.2 We register domains through a partner company. We do not place your details on the whois output of the domain due to legal reasons however if you commit any sort of illegal activity we reserve full right to provide the appropriate personnel with your details. If you wish to have your details displayed upon the whois output please contact us and we will be glad to assist you. 7.3 If you operate any site using what we deem to be excessive CPU cycles or any resources that cause strain to other sites, we reserve the right to impose new terms on you in exchange for the current terms that you enjoy (i.e. an upgrade). You are allowed to use upto 25% of total resouces available on a shared server and if your account continues to use more than 25% of the resouces, it will result in suspension. 7.4 Denial of Service (DOS) attacks directed at 3cellhosting, or any attempts to launch a DOS attack from our servers are strictly prohibited. All infractions and or suspected infractions will be vigorously investigated and may result in immediate termination of your Account. 7.5 3cellhosting reserves the right to disable/delete any feature or application provided on shared hosting service without notification if that feature/application is found to be detrimental and/or is hampering the web servers' overall health and performance. 7.6 If you are in any way disrespectful towards any member of the 3cellhosting staff we have full right to terminate your account with us without any refund. 9.1 You agree and understand that spamming, sending unsolicited emails from our servers or using email addresses that are maintained by us is STRICTLY prohibited and will qualify your Account for immediate deactivation with no refund. 3cellhosting would be the sole arbiter as to what constitutes a violation of this Clause. 9.2 You agree and understand that we have set a limit of 200 outgoing emails per hour on shared and reseller hosting, 500 outgoing emails per hour on VPS Hosting, 1000 outgoing emails per hour on Semi Dedicated Hosting and 3600 outgoing emails per hour on Dedicated Hosting to avoid any sort of email spamming from our servers. Customers cannot send more than the specified number of emails in an hour irrespective of the size of their mailing lists. 11.1 3cellhosting will use reasonable efforts to protect and backup data for clients on a regular basis, however, 3cellhosting does not guarantee the existence, accuracy, or regularity of its backup services and, therefore, you are solely responsible for making back-up files in connection with your use of the Services. 11.2 You agree and understand that any back-up which 3cellhosting may carry out will not include any media files. These include (but are not limited to) mp3, mpeg, wmv or any other video/audio files. 13.3 Sharing your password and account access with unauthorised users is strictly prohibited. You must take care and prevent others from using your Account since you will be responsible for the consequences. 13.4 Attempting to obtain another user's account password is strictly prohibited, and will result in termination of service. 13.8 You agree and understand that users who violate systems or network security may incur criminal or civil liability. 3cellhosting will cooperate fully with investigations of violations of systems or network security at other sites, including cooperating with law enforcement authorities in the investigation of suspected criminal violations. 13.10 JailShell Access - We do provide ssh access on Linux shared hosting packages but for security reason the access is restricted to specific IP's only. In order to avail the services you must have a local network connection with static ip address or else every time you will have to contact our support team to white list your current ip address. 14.1 You agree and understand that our staff members will be happy help you over live chat, ticket or phone support to setup email accounts, sub-domains, add-on domains or install any of the applications but this will be invoiced at the standard hourly rate. Our support team will assist you with any of the functions which won't work or if there's any server side problems that needs to be rectified from our end. 14.2 You will need to upload your website from your end using file manager or an FTP software. Databases should be uploaded from PHPMyAdmin and sub accounts like FTP, Mailboxes, Sub-domains, Add-on domains, Parked domains which should be setup from the client's end only. 15.1 3cellhosting reserves the right to suspend OR terminate services on receipt of abuse complaints. 15.2 An unconditional 30 day money back guarantee is provided on shared hosting, reseller hosting, semi-dedicated hosting and VPS solutions. Domain registration fees & dedicated server packages do not come under the purview of this guarantee. Refund requests after 30 days will be refunded on a prorated basis of any unused time. 15.3 Only first-time accounts are eligible for a refund. If you've had an account with us before, cancelled and signed up again, you will not be eligible for a refund or if you have opened a second account with us. 15.4 There will be no refund for new domain registrations, ID Protect, WHM/CPanel, Plesk VPS & Dedicated Server License, Virtuozzo, SSL Certificates and Site Builder as these are purchased from External Vendors & 3cellhosting does not get any refund in case of cancellation of licenses. 15.5Any service interruptions or downtime due to scheduled maintenance by 3cellhosting or our network providers will not count towards the uptime guarantee. 3cellhosting is not liable in any way for failure of third party services. 16.1 Dedicated servers & domain registrations are not included under the 30 day money back guarantee policy. 3cellhosting reserves the right to decide whether or not to issue pro-rated refunds under such circumstances. 16.2 All subscribers of managed shared, reseller, VPS and semi-dedicated hosting plans carry a 30 day unconditional money back guarantee. If you find the services to be deficient or unsatisfactory, you are entitled to a full refund of the contract amount within the first 30 days of the date of account set-up. 16.3 3cellhosting reserves the right to change the resource allocation for its services & also to change the prices listed on the website. 3cellhosting reserves the right to modify or change these terms of service at all times. All customers are bound by the latest terms of service published on this website. On termination or expiry of your Account for whatever reason you shall pay immediately all sums outstanding pending on your Account to 3cellhosting within 14 working days. any security breaches whatsoever affecting the Customer's Account. 20.2 In no event shall 3cellhosting be liable either in contract, tort (including negligence) or otherwise for indirect, incidental or consequential damages, including without limitation, loss of income, data, use or information. 20.3 Nothing in this Clause 20 excludes each party's liability with respect to death and personal injury resulting from the negligence of that party, its employees, agents or subcontractors or for fraudulent misrepresentation or under the tort of deceit. 20.6 3cellhosting will not be liable for failure or delay in performing its obligations if such failure or delay is due to circumstances beyond its reasonable control, including but not limited to acts of any governmental body, war, insurrection, sabotage, embargo, fire, flood, strike or other labour disturbance, interruption of or delay in transportation, unavailability of, interruption or delay in telecommunications or third party services (including DNS propagation), failure of third party software or hardware or inability to obtain raw materials, supplies or power used in or equipment needed for provision of the Services. The Customer agrees that it shall defend, indemnify, save and hold 3cellhosting harmless from any and all demands, liabilities, losses, costs and claims, including reasonable legal fees asserted against 3cellhosting, its agents, its customers, officers and employees, that may arise or result from any acts or omissions of the Customer, its agents, employees or assigns in connection with their use of the Services. 22.2 The Customer and 3cellhosting both agree that a court may strike out or override any part of these terms and conditions if it considers them to be illegal, unenforceable or unfair and in such cases enforce only the terms and conditions as if the offending clause or clauses had never been contained in them. The first step to successfully promoting your web site to the search engines is to create a list of keywords and phrases to target. Inevitably a lot of the claims revolve around the SEO companies' choice of keywords/phrases and they are usually quite obscure! If you choose the wrong keywords, all your efforts will be in vain! For example, if your site appears at the top of the search results for a keyword that few people actually search for, then what good is that top ranking? However, if you choose keywords that are too competitive, you may find it very difficult and time-consuming to achieve a top ranking. Therefore, it's important you target the most popular but least competitive keywords you can find. This is called the Keyword Effectiveness Index (KEI). Lastly, the keywords you choose must be highly relevant to the products and services that your business offers. So, put yourself in the shoes of your prospective customer. 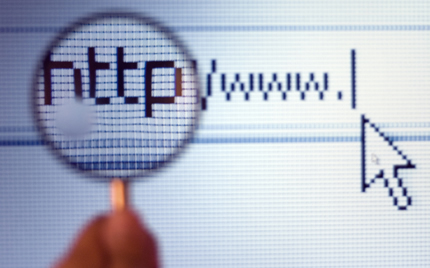 Ask yourself what they would type into a search engine to locate what you have to offer. Sound like a massive task of 'hit and miss' guessing? Don't worry, 3cellhosting Keywords Report will help you brainstorm ideas and create a great list of keywords. The great thing about these reports is that they are based on 350 million search entries that were actually entered into the top 16 search engines, including Google. One great advantage is that we even show you how often the words are likely to be entered, and that includes the words that were mis-spelt. Consider the hourly cost of your time to try and ascertain the best keywords for your site and then compare that to our comprehensive report, which costs just £35. We think you will agree that our report is value for money. All results for Keyword Searches will be emailed to customers, enabling simple transfer of keywords to your web site. 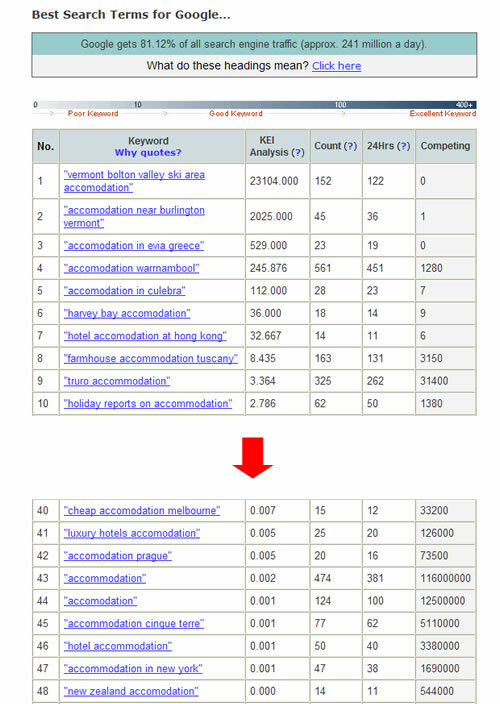 The example of our Keyword Report* based on a single keyword - accommodation. If we look at the first keyword shown it is "vermont bolton valley ski area accomodation" and shows a KEI rating of 23104. The higher the rating, the better the keyword as it has less competition. The next column, Count, shows how many times the search term has been entered in the past 160 days. This is followed by 24hrs, which a calculation of predicted searches in 24 hours based on the previous column and when the searches were entered. The final column shows how many other websites are targeting that keyword. This provides a fantastic opportunity for any business in the hospitality trade, hotels, B&B, hostels etc. If you look at the other keywords you will notice that many people forget that 'accommodation' has two 'm's as well as two 'c's. This gives an opportunity to catch extra visitors as the correctly spelled keyword has 116 million wbe sites with that keyword, compared to the 12.5 million sites with the incorrectly spelt keyword. The mis-spelling is predicted to be entered 100 times per day, these are all potential customers.